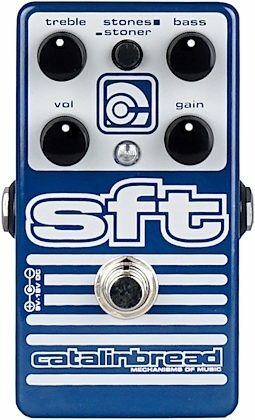 The redesigned SFT by Catalinbread is an AMPEG flavored foundation overdrive, providing classic late '60s and early '70s Stones-inspired tones with the addition of modern Stoner influenced sounds via the new STONES/STONER switch. Catalinbread also took the opportunity to expand the gain range and improve the dynamic sensitivity of the original circuit, providing the player with a more expansive big amp feel at the pick. Equally suited for guitar or bass just like the original. In STONES mode, fans of the original SFT will instantly recognize the signature AMPEG tonal character and playing feel that made those amps famous. With increased touch sensitivity and a wider gain range from sparkling clean to the warm and wooly AMPEG grind - aka Street Fighting Tone - the 'big amp feel' playing experience is even more authentic. The STONER mode opens the floodgates! 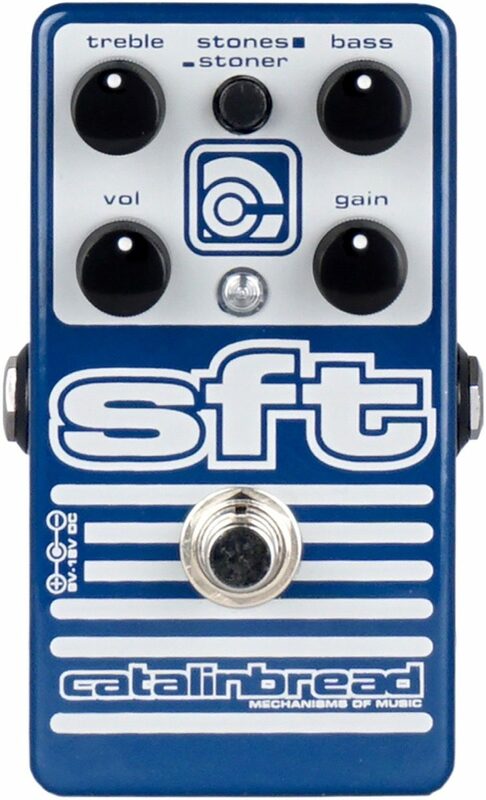 A torrent of gain, saturation, and gobs of output flow outward essentially turning the SFT into a thick, beefy sounding fuzz. Hitting this switch unleashes each of the three gain stages, creating raw, ripping leads and thick sludgy riffs that sound absolutely massive! This switch completely reconfigures the SFT and makes it become a completely new beast. Think Jekyll and Hyde! Two pedals in one! If you want the most authentic big Ampeg tube amp response, use Stones mode. If you want a rippin' high gain distortion sound that can achieve huge fuzz tones, use Stoner mode. Since the SFT basically offers you two pedals in one, wand go through how the controls work for each mode. Turning the Bass control down from noon gives a high-pass shelving response around 200hz. This allows you to tighten up the response and attenuate those woolly and woofy frequencies. Turning up the Bass control boosts all those frequencies. You'll notice as the Bass control is turned towards maximum there will be a huge bump in low end. Huge. For most purposes that is too much boost of the low end! That huge amount of low end boost is there so you can crank it for the fuzz setting in Stoner mode. For most uses, you'll probably find the Bass control wants to be somewhere between 9:00 and noon on the dial. Turning the Treble control down from noon gives a low-pass shelving response at around 1000hz. Typically you'd turn the Treble down below noon in the following situations: you've got the Gain set low for clean response, you're in Stoner mode dialing in a woolly fuzz tone, or you're playing bass. Turning up the Treble control first gives you a nice kick in the upper mids from noon to 2:00 and then beyond that the sound will get increasingly more trebly. For most uses on guitar in Stones mode, you'll probably find yourself setting the Treble from noon to 2:00. In Stones mode, the range of the Gain knob has been tuned to be very similar to that of the volume control on a big non-master volume tube amp. So, from minimum Gain to about 10:00, the response will be clean and bright. From 10:00 to noon, you'll get edge-of-breakup response that is very sensitive to pick attack. From noon to 2:00, you'll hit the overdrive sweet spot, just like that of most tube amps. And from 2:00 on, you'll get increasing crunch and saturation. - Baxandall tone stack: an elegantly simple yet powerful design that allows shaping of treble, mid-range and bass frequencies utilizing only two controls. - Volume and Gain controls: capable of boosting an amp into overdrive, or providing "big amp" sounds at lower volumes. - STONES/STONER mode switch: switch between classic 60s AMPEG and modern high gain sounds. - 9V battery or DC power supply for use from 9-18VDC: 9v operation yields smoother compression and a softer feel. Powering at 18v allows for more headroom and a more percussive attack. zZounds is an authorized dealer of Catalinbread products.